No matter where in Houston you live or what type of automobile you drive, when you want the highest quality comprehensive automotive repair, we are the company to call. We have been handling from the simplest to the most complex automotive problems Houston area drivers have for years. We provide fast, effective, excellent, automobile repair services at affordable prices. We have a well-trained, licensed, experienced staff with expertise in all areas of automobile repair. We also have the state-of-the-art equipment needed to repair even the latest model automobiles. Our Houston Body Shop uses computerized diagnostics to determine what is wrong with your automobile. Our highly-skilled, experienced, licensed technicians then use our state-of-the-art tools and equipment and the highest quality replacement parts to solve the problem and leave your vehicle in tip top condition and looking and running like new. No matter what type of problem you have with your automobile, we are the only company you need to call. We can get to you in a flash, fix your vehicle on the spot or safely transport it back to our facility to do the repairs. We can even help with your insurance claims. If you want to ensure your vehicle will continue to look its best and maintain its resale value, it's important to go to the best body shop in houston. We are the Houston body shop you should turn to for all the body work services your vehicle needs. Our technicians use cutting-edge techniques, top quality paint and authentic replacement parts when they repair the minor dents and dings or major damage to your automobile. When they are done, your vehicle will look new. Other Houston body shops can't match the quality of our work or our affordable prices. We are the auto body shop you should choose when you want the best results. We are the best body shop in Houston. We're the collision center Houston residents have long turned to for quality collision repair services. We can handle anything from simple fender bender fixes, hail damage repair, bumper repair, wheel alignments to complete car repainting. Don't just take your automobile to the nearest body shop. If you want the job done right, right away and at the right price, give us a call. No paint and body shops in Houston can match the quality of our work. 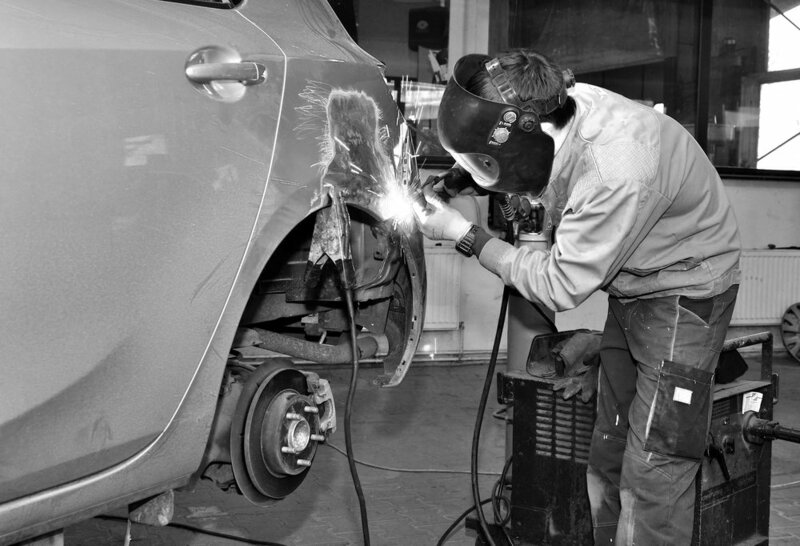 When it comes to quality auto body repair, welding and car repainting, we are the Houston body shop you need. To remain comfortable when the temperature gets hot in Houston, the air conditioning system in your automobile must be functioning at peak efficiency. Our team of expert automobile air conditioning system technicians will go over the system in your vehicle from top to bottom, identify and repair any leaks or other problems, replace all damaged or worn parts, recharge the Freon and have your AC blowing air as cold as an Artic winter. Don't leave your comfort in the hands of some random auto service shop. We can make sure the AC in your automobile is working at optimal efficiency. Modern automobiles have very complex electrical systems. If they are not properly maintained and repaired, you can end up with serious electrical problems that can cause your vehicle to shut down or endanger the lives of its occupants. If you want to ensure all parts of the electrical system in your automobile is in good working order and any electrical problem you are having is handled properly, bring your vehicle to us. Our technicians receive advanced training in dealing with the sensitive, complex, electrical systems on modern automobiles and can make sure your vehicle's electrical system is functioning as it should. We have certified Mechanics who will give the best service for all auto repair services. We pride ourselves in our fast delivery and professional service. Auto Repair Shop Houston TX has proudly serviced that area for over 27 years and have a full team of experienced auto repair mechanics. Cho’s Auto Body Shop is a full service transmission repair shop with licensed professionals. At Cho’s, we use the latest diagnostic equipment to fix your car in a quick and efficient manner. Our transmission repair services include transmission diagnostics, automatic transmission rebuild, transmission preventative system, re-manufactured standard transmission replacement, re-manufactured differential replacement, minor transmission repairs, re-manufactured automatic transmission replacement, re-manufactured transfer case replacement, clutch replacement, and auxiliary cooler installation. Our trained professional’s will make the most cost efficient decisions to ensure the best transmission repair & replacement. Transmission Houston provides the highest quality repairs and replacements in town. Search best body shop in Houston and you will see Cho’s Auto Body Shop listed as one of top body shops in Houston. Our expert technicians ensure to make the most efficient repairs or replacements in order to give the best prices. We are the best body shop in Houston when it comes to automotive painting. Auto Painting Houston has done paint work for thousands of cars in the past 27 years and we have dedicated our time and mastering the art of paint jobs. Our professional automotive painting is second to none. No other auto paint shop offers the wide range of quality paining services we do. Compared to us, the other paint and body shops in Houston do substandard work and charge prices that are much too high. At Auto paint shop Houston, our specialists have the experience, know-how and quality services that other paint shops in Houston don’t provide. We are the auto paint shop that sets the standard for quality when it comes to auto painting. We may not be the nearest body shop, but we are the body shop Houston residents prefer when it comes to body repair. Cho’s Auto Body Shop has all the latest equipment in color scanning and can give you the perfect paint job Houston. At Auto painting Houston, we ensure that you’ll be satisfied with the results of your newly painted vehicle. So if you need a car paint job Houston, give us a call at 832-637-5599 for our expert technicians who will thoroughly explain the process. When they need any type of glass in their automobile repaired or replaced properly, we are the body shop Houston automobile owners have turned to for years. Whether they need a windshield replacement on a late model automobile, a side window installed on a classic car, or any type of window for any year, make or model of car, truck or SUV, we are the auto body shop they can depend on to handle the job. We can install or tint any size or type of automobile glass. Other body shops are limited in the windshield replacement or other types of automotive glass they can repair, tint or replace. We have earned a reputation for being able to find and install any type of automobile glass. Whether you have been in an accident or ran over a road hazard and it left one or more of your wheels damaged, we can help. Our mechanics and technicians have years of experience repairing and replacing the wheels on vehicles of all types, foreign or domestic, new or old. Any kind of repair the wheels on your vehicle needs, we can handle it. It can be something as simple as tire mounting and balancing, an alignment or a complete wheel replacement. We have the tools, team and resources to take care of it for you quickly, affordably and properly. When you want your wheels taken care of properly, no other body shops can match the quality of our work. Alignment houston provides quick and affordable wheel adjustments, just search body shops near me and give us a call at Cho’s Auto Body Shop! We are much more than just a paint and body shop or an auto collision repair center. We are a complete automotive repair shop. When they need any type of vehicle computerized diagnostics, auto repair, fender bender fixes, hail damage repair, professional automotive painting, pinstriping, body repair, or a high quality auto collision repair, Houston residents have confidence in our ability to do an incredible job. For years they have trusted us to keep their personal, recreational and work vehicles looking great and performing at optimal efficiency at a price they can afford. The backbone of the auto repair service we offer is our well-trained, licensed, experienced staff. They have made our auto service shop an industry leader. Our technicians are highly-skilled, prompt, friendly and professional. It is their expertise and commitment to quality that has helped us to earn our reputation for excellent work. They have made us the automobile repair, air conditioning, electrical services, paint and body shop that has played a vital role in keeping vehicles all over Houston in good running condition. It is our technicians that make us the company we are today. We give free estimates and accept insurance claims at Auto repairs houston. Keeping our customers happy is the key to our success. From the first phone call until the customer drives away happy, we make every effort to ensure they are treated with respect and receive the highest quality service in a timely manner and at an affordable price. Whether they need us to be a car paint shop, give their vehicle a tune up or serve as a collision center Houston residents and business people know they can always depend on our staff to do our very best to meet their automotive needs and always be polite, courteous, friendly and professional and treat them right. We guarantee all our work will be of the highest quality. If any customer is not satisfied with our auto body, engine repair, welding, air conditioning, glass, wheel or electrical services, we will work to make it right. We are honored that people trust us to not only serve as their collision repair shop and car paint shop, but to also help with their insurance claims to ensure they are treated fairly. That makes us willing to go the extra mile to ensure that each and every customer is satisfied with our work and our prices fit within their budget. If you live or do business in Houston and need any type of services for your automobile, give us a call today. Our staff will be glad to work on your vehicle and have it looking and running like new. Founded by Kyu Bo Cho in 1984, Cho's Auto Body stands for honesty, integrity, attention to detail, a commitment to quality, but above all, customer satisfaction.